When David Wills invited President Abraham Lincoln to stay in his home before the dedication of the Gettysburg military cemetery, he hardly suspected that America's most famous speech would be completed in his guest bedroom. Wills, a prosperous 32-year-old attorney, owned the largest house on the town square. Under his direction, the Commonwealth of Pennsylvania purchased 17 acres for a cemetery to honor the Union dead from the July battle. He arranged for the cemetery dedication on November 19, 1863, with Edward Everett as the main speaker. Lincoln was invited to offer "a few appropriate remarks." President Lincoln arrived at the Gettysburg railroad station the day before the ceremonies and was escorted to the Wills home. His special train included others from Washington such as Cabinet members and foreign ambassadors. While Lincoln, Everett, and other dignitaries ate supper together, serenaders and crowds gathered outside, calling for the President. Lincoln eventually appeared, but declined to make a speech at the moment. The next afternoon, on the edge of town, a crowd of more than 10,000 would hear Lincoln's brief masterpiece, now considered the product of an entire lifetime. Contrary to popular belief, the painstaking Lincoln had not dashed off this speech on an envelope while enroute to Gettysburg (for one thing, five original copies of the speech exist -- all are on standard letter paper). 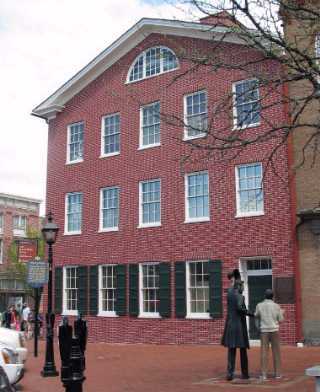 However, Lincoln apparently produced the final written version in a second-floor bedroom of the Wills house, shown at the far right. Once the cemetery dedication was over, the Marine Band and other members of the military escorted Lincoln back to the center of town. After dinner at the Wills house, Lincoln greeted guests in an informal reception. Standing in the hallway which faces York Street, he met visitors such as John L. Burns, the 69-year-old Gettysburg cobbler who was wounded after he spontaneously joined Union troops in the battle. Visiting Information: You will find the house in the middle of town on the Lincoln Highway (Route 30). The building has been renovated and is operated by the National Park Service, which has opened it to the public. For more information call 717/334-1124. Boritt, Gabor. The Gettysburg Gospel: The Lincoln Speech That Nobody Knows. Simon & Schuster, 2006. Graham, Kent. November: Lincoln's Elegy at Gettysburg. Indiana University Press, 2001. Hoch, Bradley R. and Boritt, Gabor S. The Lincoln Trail in Pennsylvania. Pennsylvania State University Press, 2001. Johnson, Martin P. Writing the Gettysburg Address. University Press of Kansas, 2013. Kunhardt, Philip B., Jr. A New Birth of Freedom - Lincoln at Gettysburg. Boston: Little, Brown, 1983. Mearns, David C., Dunlap, Lloyd A., Wilson, Douglas L., and Sellers, John R., contributors. Long Remembered: Lincoln and His Five Versions of the Gettysburg Address. Levenger Press, 2011. Wills, Garry. Lincoln at Gettysburg: The Words That Remade America. Touchstone Books, 1993.